This 1965 Chevrolet Corvette convertible has its original numbers-matching, 327 cubic-inch 365 horsepower L76 V8. That makes this well-presented example significant, rare, and absolutely cool. Finished in a factory correct Nassau blue paired with a white top, the overall presentation is fantastic. The body is in excellent shape with straight lines, correct trim and emblems topped off with knock-off wheels. The overall appearance is very close to how it looked new in 1965. The Nassau blue is a fantastic color for a convertible and pairs nicely with the white top and white/blue interior. A matching Nassau blue hardtop is also included! The interior is lightly restored with new seat upholstery and carpet. The dash and console appear to be in factory original condition and are in excellent shape. The gauges show some nice patina and appear to be factory original and untouched! The bucket seats are comfortable and the center console housing the 4 speed ties everything together nicely. Opening the hood exposes the original numbers matching 327 cubic inch V8 factory rated at 365 horsepower. The motor runs very strong and is equipped with many factory components under the hood. The overall running condition of the car is excellent. Recently tuned, the throttle response is great and sounds awesome at high RPM pulls. Our in-house service shop recently rebuilt the entire front and rear suspension, installed 4 newly rebuilt brake calipers, lines and brake hardware. This car rides great, stops good and with a recent alignment goes straight down the road. We have taken many precautions to make sure the new owner will thoroughly enjoy their new Corvette. 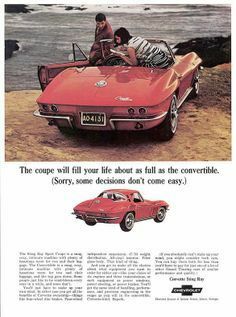 Look around at the cars on the road today; there is no classier way to drive then in an original 1965 Corvette!